Lucille Carver remembers when she first heard reports of a dog-nabbing bird in North Bay. But now as a carnivorous, thirty foot wide prehistoric pterosaur terrorizes the city, Lucille wishes it was only small dogs. 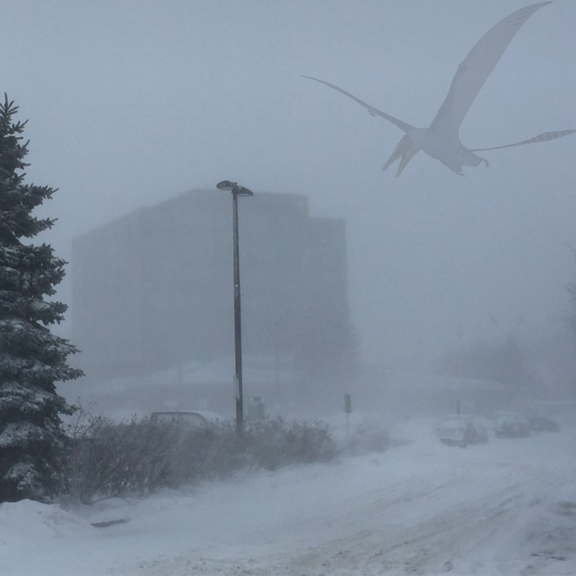 The pterosaur, which emerged from the icy waters of Lake Nipissing, has been on a rampage throughout North Bay. Destroying public property and eating at least seven men, the flying reptile has caused havoc and left destruction through the city. Missy Aden, who was at the Cassell’s Tim Hortons Saturday morning, told The North Bay Bay about her and her 16 year old son Johnny’s brush with terror. Local scientist Headley Constant was hesitant to speculate as to exactly what kind of pterosaur the flying lizard could be. But Teri Turner know this isn’t the case. As self described “animal lover,” Teri changed her Facebook group “Rusty’s Page – Helping lost pets get help” to “Animal sacrifices for the Great Pterosaur!! !” on Sunday. Turner is now organising a day of sacrifice. The North Bay Bay will update this article as more speculation is posted on Facebook.